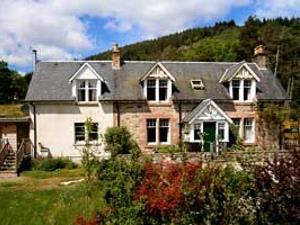 Westward Bed & Breakfast01456 415708work Bed & BreakfastWestward Bed & Breakfast is a traditionally built Highland home in the rural village of Cannich. It is on the doorstep of the National Nature Reserve Glen Affric, which protects one of the few remaining areas of the ancient Caledonian pinewoods, as well as being within easy reach of Loch Ness. The house retains many of its original features and the pine linings throughout give it a lovely warm atmosphere. We offer friendly, comfortable accommodation for anyone on a relaxing tour of the locality or for those seeking to climb the nearby Munros, cycle the glens, fish in the rivers and lochs or try the numerous beautiful walks. Please use the calendar below to check availability and reserve a room. We will endeavor to confirm your reservation within 24 hours. We will require a £20 per room per night deposit which we will take from your credit card when we confirm your reservation. The balance is paid on arrival. If you are travelling with children and would prefer to have an extra mattress/cot in your room please e-mail us directly to check availability and rates. We generally only let one room out as a single each night (Room 2). However, if this room is already booked and you are looking for single occupancy please get in touch and we will see what we can do. Very friendly, choose your own breakfast.